We're not ones for tooting our own horns but we think it's important that you can find a little bit more about the way that we work & how that could fit your day. So here's some feedback from previous stories we've had the honour to capture. We couldn't have been happier with Chris and Gillian. We first met them a few weeks before the wedding, which was great because it gave us a chance to discuss what kind of photos we wanted and they kept us right with the things we needed to think about for the wedding photos. They were so friendly and welcoming and understood straight away the kind of photos we wanted. On the day itself, they were just brilliant. Before the wedding started, Gillian went to the girls and Chris went to the boys, which we really liked because it meant they could capture us getting ready before the ceremony. During the wedding itself, we hardly noticed them, they just let us get on with the day but somehow still managed to get some brilliant shots. A lot of our guests commented on how friendly and easy going they were. We were over the moon when we saw the final photos - they were natural and really captured the atmosphere of the day. It took us ages to put together the album because there were so many good ones to choose from! We really couldn't recommend them highly enough. By far, the best decision we made when planning our wedding! Not only was our day captured brilliantly but the emotion and feelings were captured too. We couldn't have felt more relaxed working with Chris and Gillian, and they took virtually no time out of our day at all. We are so happy with our photographs and have had nothing but amazing compliments towards them. We were over the moon with Chris and Gillian and the time they spent with us at our wedding, they blended in perfectly to our big day. From meeting us beforehand to get a feel of the type of day we were planning, to joining us getting ready and documenting our wedding and reception, Chris and Gillian absolutely nailed it. They captured perfect moments of our friends and family that we would have missed. They were unobtrusive yet always there if we needed them (Gillian became my go to lippy carrier). They took time and care to understand what we wanted and made our (rather vague) brief a reality for us. We felt they were really well prepared and had put a lot of thought and effort into finding perfect locations to shoot in and coming up with ideas of what to snap in an interesting way. They captured the parts of the day we will treasure forever, the happiness, the nerves, the glances that said it all. Absolutely perfect, we would recommend them to anyone. OH MY WORD!! I cannot even begin to thank you both enough. We really are totally overwhelmed with the photography. I’m sure you get this all the time but hand on heart, I don’t think I’ve ever seen a photograph of myself where I think I look nice, we don’t have any in the house as I don’t allow them. But even when I’m pulling my goofiest faces you have managed to make me look pretty. We loved the slideshow and the music and thought wow we’ve got some really good ones and then when we looked through the full edit there are ALL wonderful, there are some absolute crackers, you totally nailed it. Capturing the essence of the day and all the details I had fretted about so much and then didn’t even notice. It is so special having it all documented from your perspective through your rose tinted lenses, everything looked/looks so perfect! It was so nice for me to see the guys getting ready and vice versa for Tom, it is a big part of the day that you don’t share together and you brought it alive for both of us. I think my parent are going to hit the roof when they see them, mum is full of self doubt and she looks absolutely beautiful. Having stayed composed all day and afterwards actually generally being pretty chilled about it all, last night when we were looking at the pictures I have to admit I did well up a bit. We knew you would do a wonderful job and we had no doubt there would be lovely pictures but honestly we are beyond thrilled you guys have exceeded our already high expectations. Thank you so much for recreating our special day which goes by in a blur of emotions, cake cutting deadlines and being spun around in circles after one too many damson gins. You’ve captured our emotions and memories so we can hold onto them forever and that is a really really wonderful thing. 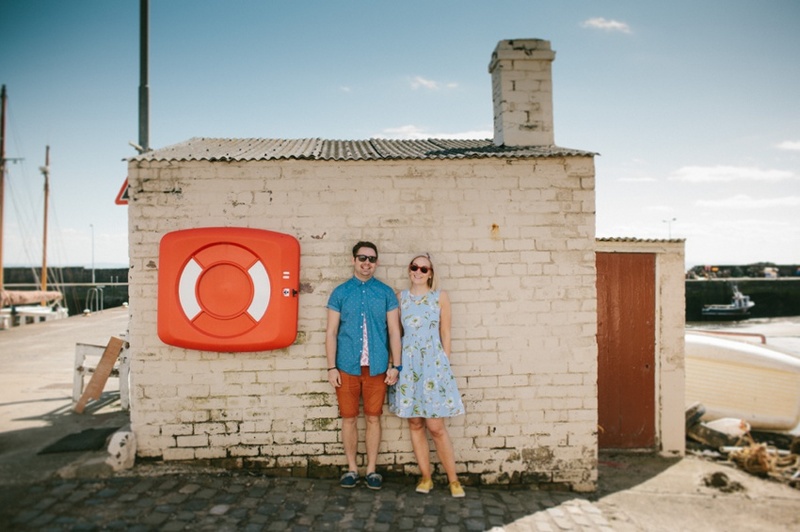 You may remember these lovely pair from the feature on their engagement shoot in Pollock Park. Their gorgeous, intimate celebration at Cottiers in the Westend of Glasgow was led by a very loving & happy pair of families. 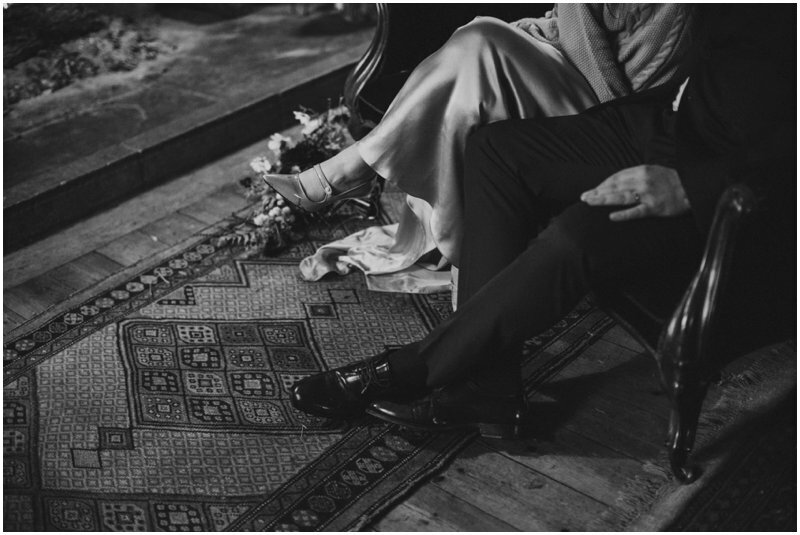 Kelsey & Alan run a website full of beautiful old time pieces: Twisted Time, a charming & totally infectious couple with unrivaled effortless style & grace which made their day a real delight to document. A couple who are up for jumping over fences & standing in mucky puddles are a couple after our own heart. The very lovely Tommy & Jen at an infamous Glasgow Graffiti spot. Armed with our cameras and dog Bertie we went on a road trip down to the lovely quaint seaside town of Portsmouth to capture Leila and Pete's wedding day celebrations. Here are some of our favourites from the day, and what a day it was! 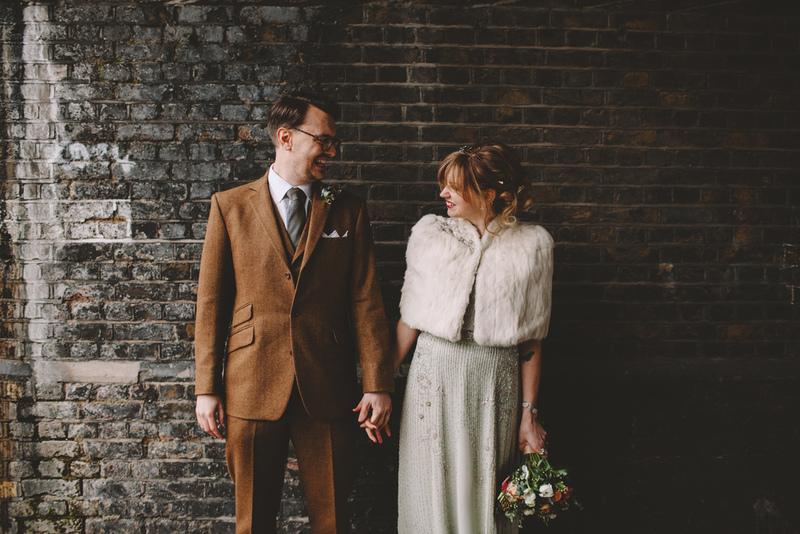 Zoe and Phil got married at at The Old Finsbury Town Hall & celebrated at The Roost just round the corner from their home in Dalston. Zoe made her own red lace dress, the most downright gorgeous we’ve ever photographed. The kind of love shown between these two & shared with their family & friends was totally contagious. 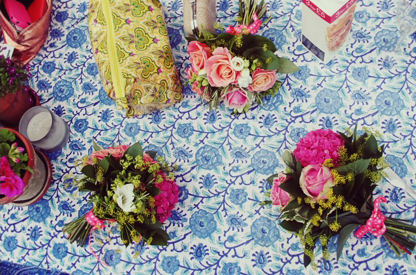 We utterly loved this wedding. Apologies in advance for the gigantic blog post but you'll see why. Doing this job we tend to get a lot of 'life jealousy'. Lucy, an accessories designer & Martin, advertising man, had such an amazingly warm, funny and super stylin' wedding that we kind of wanted to squeeze them and steal their wee boy Bobby (who spent the whole day oogling pretty ladies, without a care in the world).